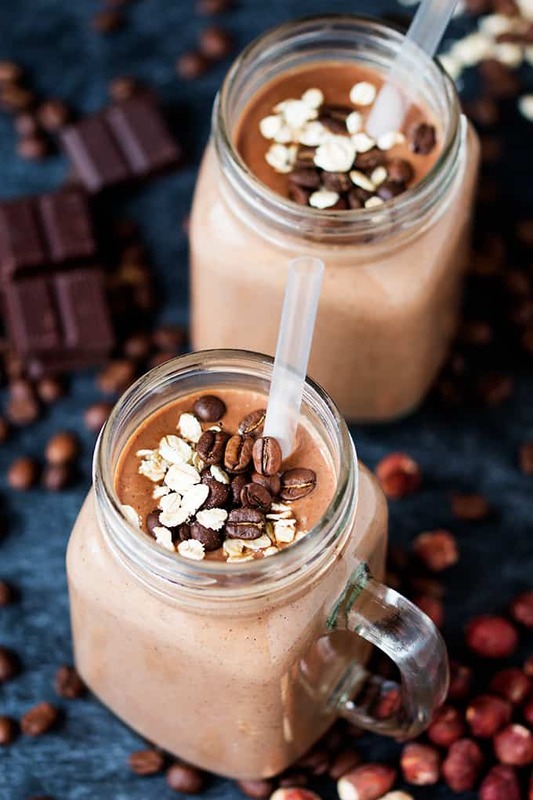 This Oaty Mocha Hot Smoothie is one of my favourite hot smoothies. Its Comforting, tasty and packed full of nutrients, this HOT smoothie is perfect for those colder months. The days of ice cold smoothies have passed for another year! No more shivering whilst you down the icy cold green stuff in order to feel healthy and energised. But don’t put those smoothie makers in the attic! Warm, comforting, yet still-healthy smoothies are a real life thing (honest – I even did a whole series on them last year). 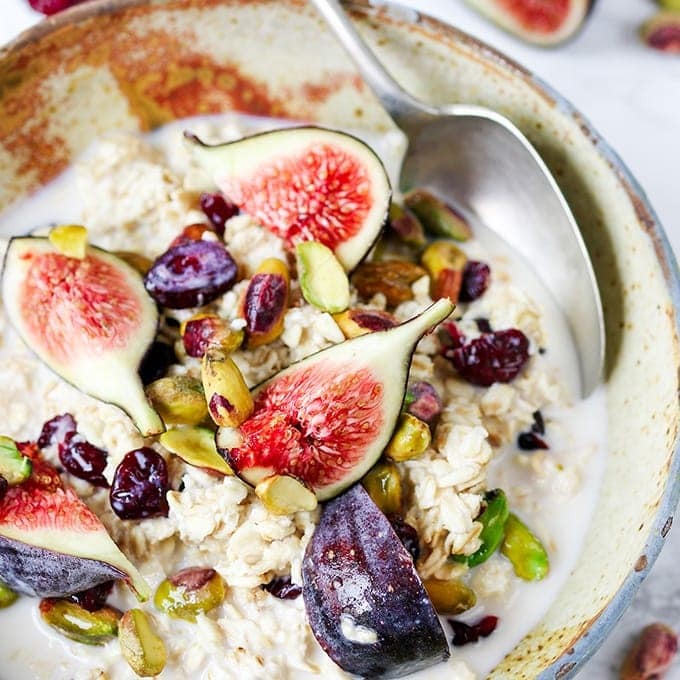 This one is creamy and slightly sweet, but with a kick of caffeine, plus some seeds, nuts and oats to get you ready for a busy day. Waaaay better for you than the two-thick-slices-of-buttered-toast-breakfast I had a couple of times last week – that made me just want to crawl back into bed again to sleep it off. Back home and logging on this morning, I realised I had absolutely nothing to post! I usually have a few recipes and photos lined up, but not this time. 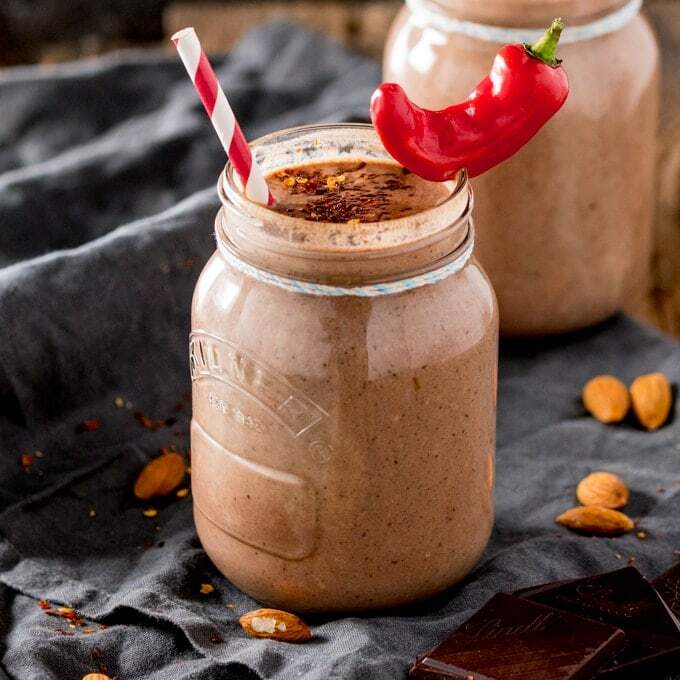 So what could be better than photographing this Oaty Mocha Hot Smoothie my breakfast! …and wow, I had so much more energy than last week after those buttered toast breakfasts! Have you tried any hot smoothie recipes yet? I really hope you try this. If you do, please read the warning below first about hot liquids and smoothie makers. Don’t fill your smoothie maker up with hot liquid. It’s either going to shatter the glass (if you have a glass jug) or it’s going to come wushing out with a tonne of pressure when you open the lid after whizzing things up. Check your smoothie maker or blender can take warm or hot liquids. This recipe calls for a little of the warm milk to be added the other ingredients along with cold water before blending. The rest of the warm milk is added after blending. 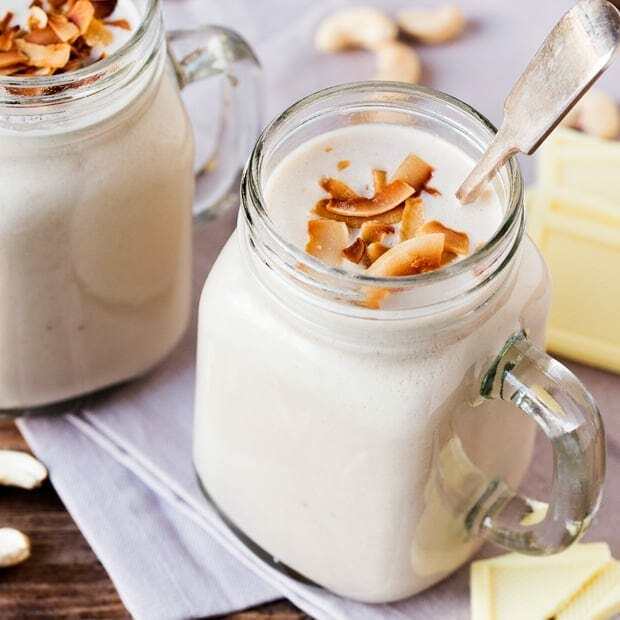 Comforting, tasty and packed full of nutrients, this HOT smoothie is perfect for those colder months. Add the dark chocolate to a jug, pour in the milk and the espresso. Microwave until the mixture is warm and the chocolate has melted (you can do this in a pan if you prefer). Place the oats, banana, hazelnuts, chia seeds, maca powder, the water and approx. a fifth of the milk mixture to your smoothie maker or blender. Add in an extra splash of cold water if you think the liquid is too warm (see warning above about hot liquids and smoothie makers). Blend on high for a minute until the oats and chia seeds have been completely incorporated. Whilst it's blending, further heat the rest of the milk mixture until hot, but not boiling. Pour the blended oat mix into your cup, stir in the milk/chocolate mix and serve. I never been a huge smoothie fan, but you’ve converted me with this hot smoothie. Yummy. Ugh! This was not my cup of tea(coffee). (because l’d love to cut out most dairy and I tend to not eat anything else with my latte.. very bad I know…) and this is incredible! I actually turned my latte into this while reading the recipe 😉 AND: I think it’s going to be equally good with almond milk because of the creamyness of the banana. Didn’t have any chocolate on hand and substituted for 1 tsp raw cocoa powder. 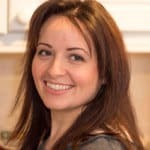 Do you and an alternative to the banana and nuts? I’m allergic to both. 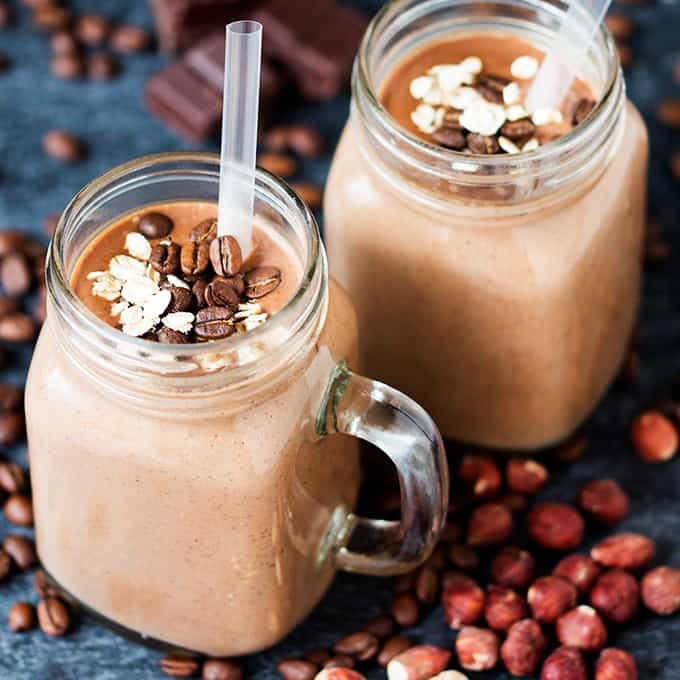 🙂 An allergy (nut/banana) free oat hot chocolate smoothie…Could I use pumpkin seeds in place of the nuts/soy milk and maybe raspberries for sweetness? Just a thought. ooh that’s a tough one. The banana adds a bit of creaminess, so I think 1/4 of an avocado would be a good replacement. The nuts could be replaced with pumpkin seeds, or I’d be tempted to try a few cooked chickpeas? Personally I wouldn’t go for raspberries, I don’t think they’d work with the coffee or the milk (I prefer to keep my fruity/berry smoothies dairy free – like this apple, elderflower and pomegranate hot smoothie). A touch of honey would be good for the sweetness though. Hope you enjoy it Susan! I’ve never had a hot smoothie, but this is to die for! Really need to try it ASAP! Oh my, what a great recipe for fall! 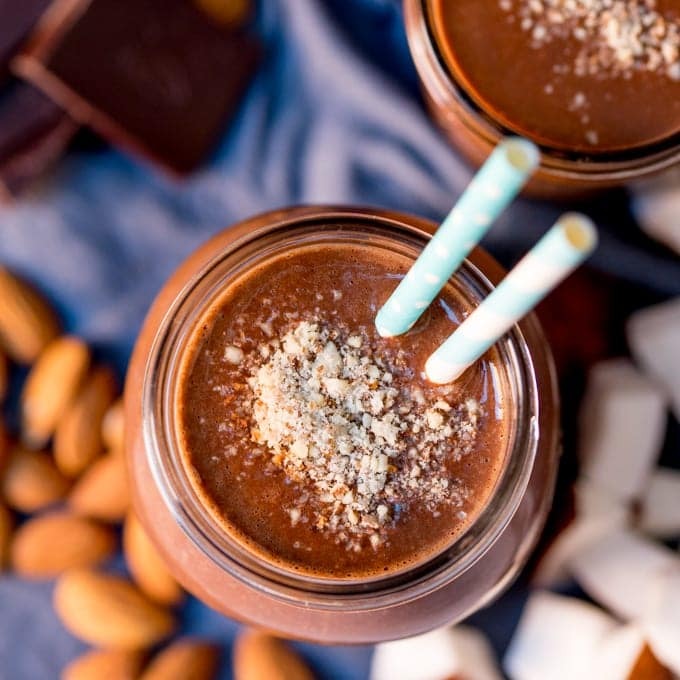 Now that the weather is getting cooler, this hot chocolate smoothie is perfect for chilly mornings and its also full of nutrients!